A problem frequently encountered in almost all applications is the build-up of deposits on heat transfer surfaces. Alfa Laval supplies a wide range of cleaning agents suitable for removing most of these troublesome deposits and restoring performance to optimal levels. The time-consuming work of opening plate heat exchangers can thus often be avoided by using an Alfa Laval Cleaning in Place (CIP) unit. Alfa Laval CIP units are available in a wide range of standard sizes, with optional extras that include reversible flow and explosion-proof capabilities. Alfa Laval CIP units can be used for all types of heat exchangers, including spiral heat exchangers, shell-and-tube heat exchangers and gasketed, welded and brazed plate heat exchangers. 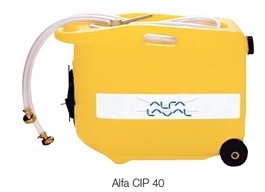 Alfa Laval CIP units are a cost-effective way to achieve better performance, and the cleaning agents used are, of course, environmentally friendly.